Lately it has been so gloomy here in Philadelphia, but I have really been enjoying it. dress for a fun and quirky look. so I am really beyond excited. Many, many pictures to come! PS- don't forget to enter the Lulu's $50 giveaway here! the bag and the hat matches really well! So awesome! I agree with you about rainy days being better than sunny ones at times. I'm just the same way. Oregon is very very rainy, but I adore it. When summer hits, that's when I get gloomy and hide indoors. So you're not alone! xo Have fun in the big city! Oh wow! That dress is gorgeous!! Oh my goodness you are just too cute for your own good! Lolz. 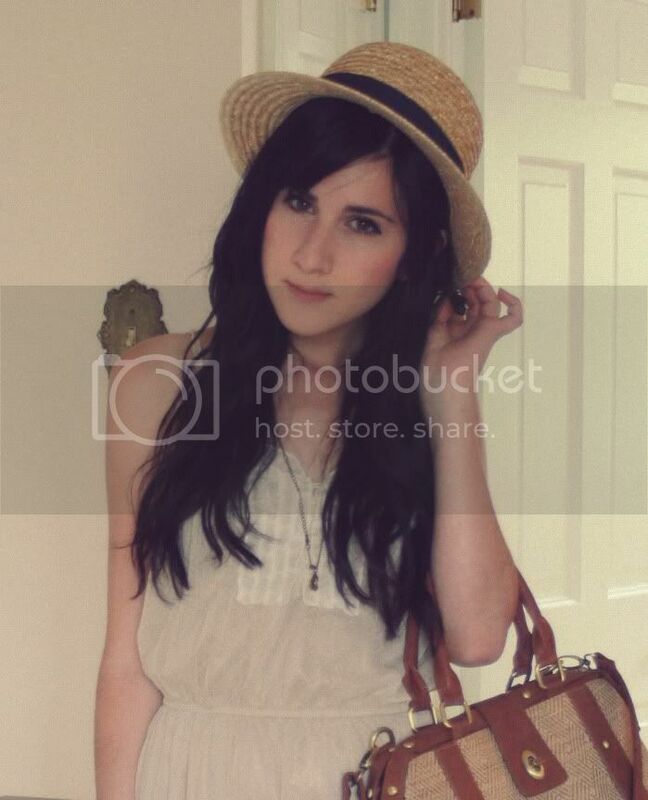 I am totally dig the vibe of your look and I think you executed the look of "girly/quirky" perfectly. your outfit is so lovely! I'm going to be at the meet up, so I really hope that we get to talk!! That dress is lovely! I LOVE socks with the frill on top, perfect for heels! Overcast days seem to put me in a happy mood, too. You always look like an absolute doll! I just bought the JC Miracles and am in total love with them. Have fun in NYC, sweetheart! I love your dress!! Have fun in NYC. I've never been. I love love love this! I love the bright colored socks paired with the white dress, too cute. And you look lovely as always! This dress is so pretty! My best friend is like that too and I always dedicate that Garbage song to him ("I'm only happy when it raaaaaaaaaains"). Have a great weekend! I think I just adore you. Your style is so classic yet so fresh. Keep it up! Love this look - the dress looks so great with those amazing wedges! And have a great time in NYC - I love it when I can make a trip into the city. I need to get a pair of printed socks. They go perfect with those kind of shoes! 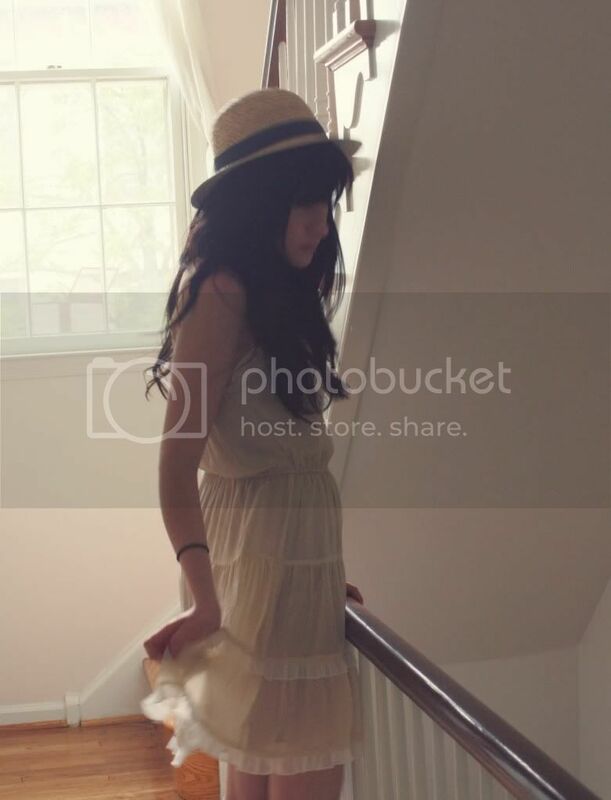 Love the sun hat and the dress. Such a cute outfit! love to always see you wearing dresses, you always look good! Oh my what a lovely dress! Have fun at the blogger shindig! I'm sure you will have lots of fun! We will be looking forward to seeing pictures and outfit pics! I love your socks, by the way, they look lovely! You look beautiful, I adore that dress and it looks perfect with your socks and heels...so chic! Have fun on your trip! Nice socks :). I'm a fan of rainy days too. Nothing better than to stay inside, watching a movie and drinking some hot coco :). those pictures are really good. And the dress is so wonderfull. I'm really loving that dress! So sweet an delicate. All the crazy patterned socks are simply fabulous too. I love the socks with the shoes, so cute! 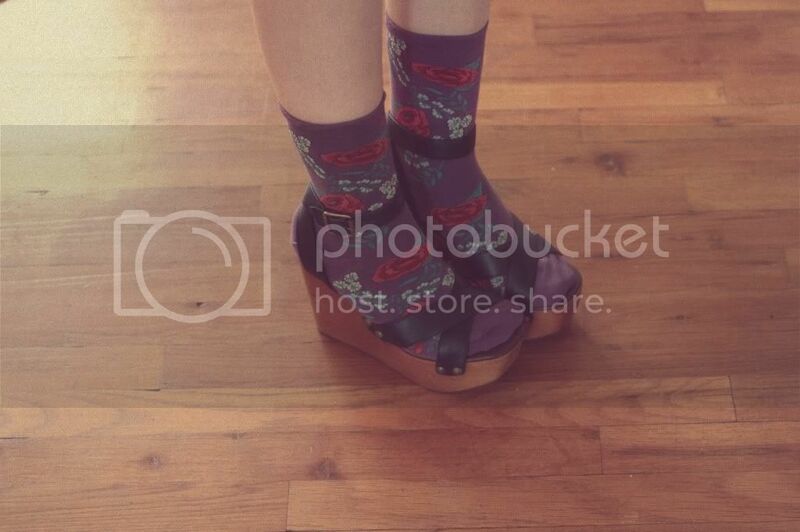 love your shoes with this socks ! Those socks are great! They're like a hidden floral surprise. Cute socks! Your outfits are always so lovely. I have to say I agree about the weather thing. It's raining like crazy here right now but I couldn't be happier, I have a cat on my lap and I'm wrapped up all warm in my blanket: bliss. wow!! !I really love the firts picture! !your nice outfit is so adorable. love this dress on you! and i have a sock obsession too :) i just wore some in my last post. gotta check out this ozone website. have such a great time this weekend! sounds like alot of fun xo. sounds like my kinda days, i love to stay in and relax with movies and of course my cat too haha i wish i was going to the blogger meet up but i won't be in nyc till mondayy arrgh. next time maybe. Absolutely love the dress, and the socks are simply adorable! I really like rainy days too, it's so nice just staying home all cozy and warm when the rain falls down outside. 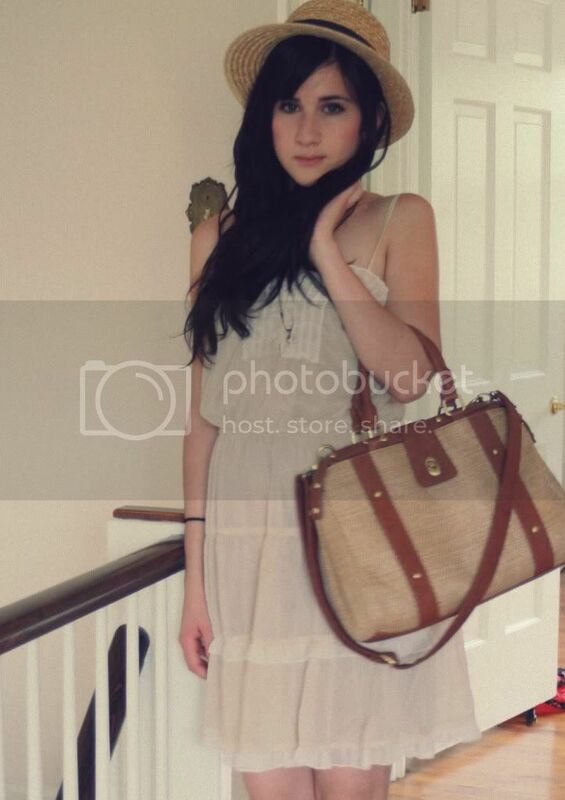 you look really pretty in here, I like your dress a lot :D have a great weekend! The socks are lovely, as is your dress. Have fun in New York! This is insanely pretty!!! That dress is amazing. And I love the effect of these photos! 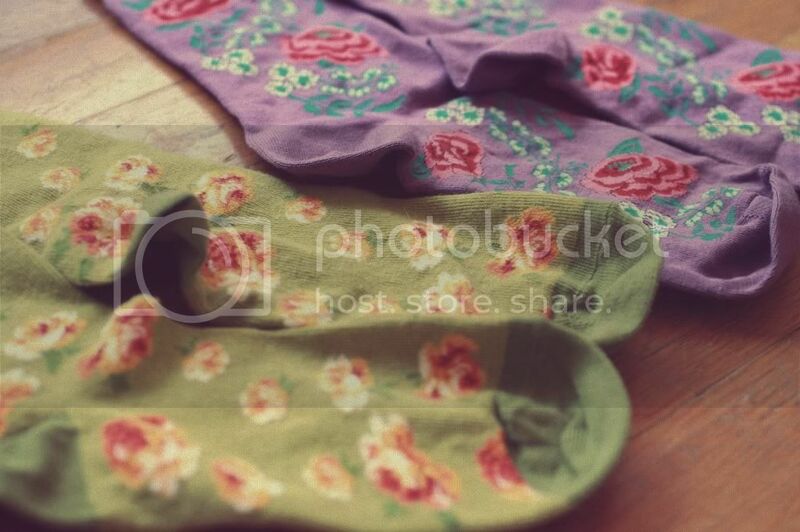 What beautiful floral socks! <3 I'm about to enter your giveaway now! Remember to enter my £100 ASOS giveaway! These might be my favorite pictures that you've ever posted! They're so pretty! And I love those socks! Aww, I love the socks! Been looking for something similar, thanks for the tip. youre going to LOVE nyc! its my fav place in the world. and i love ozone socks, theyre such a cute brand! Looove this outfit! And yes, those socks are sooo cute! :D Have fun at the blogger meetup!! Lovely socks!! I love how you mixed the pattern into your outfit with those shoes!! Your outfit is so pretty!! I love every piece!! that's very nice photos of you. love your dress! oh the dress is so pretty! I just love how you managed to pull those socks off. I could never! That dress is gorgeous girl! Miss you!!! It's so wonderful that you're in NYC right now! I'm going there for three weeks in July - I've never been there before either, though I've wanted to go ever since I was a little girl. Can't wait to read everything about it - and of course see photos, photos, photos! the dress is so cute... the color, texture,... all perfect for a tranquil day! Such a gute dress! lovely with the hat! awwwww those socks are so cute! have fun in NYC! Those socks are so cute! I'd love to be brave enough to show off my printed socks like that. Thank you so much love for your comment in my blog.. Pretty socks! And your outfit is amazing. I love it. Love the dress! Love the combo! your outfit is soooo beautiful. very feminine and chic! I love this dress...gorgeous + those socks are too cute! Those little floral socks are adorable! I love them paired with that pretty green dress. Awesome hat too! 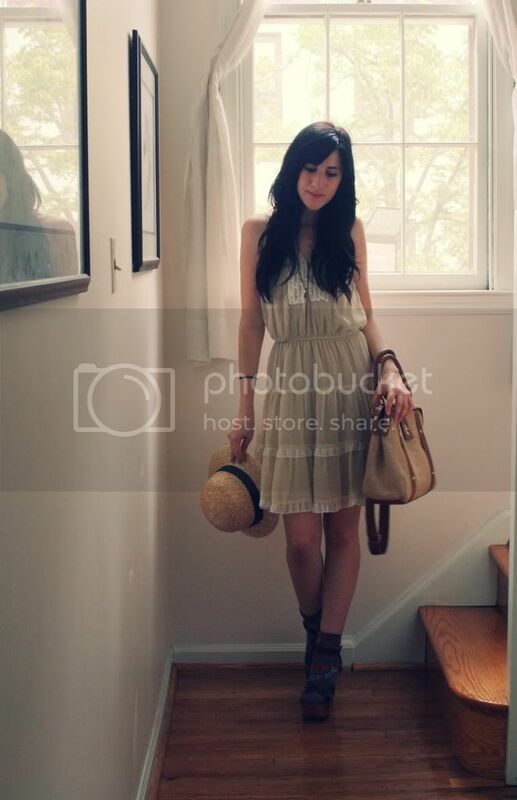 Wow, very nice outfit, the dress is so sweet! I'm sorry it was a bit gloomy for you there. You look so beautiful in this dress. I like how romantic it is. I really wish I could wear socks the same way, why do I look so stupid if do?? But the socks are a little bit too dark, lighter ones would have done a better contrast. You always have the most beautiful, flowy dresses.